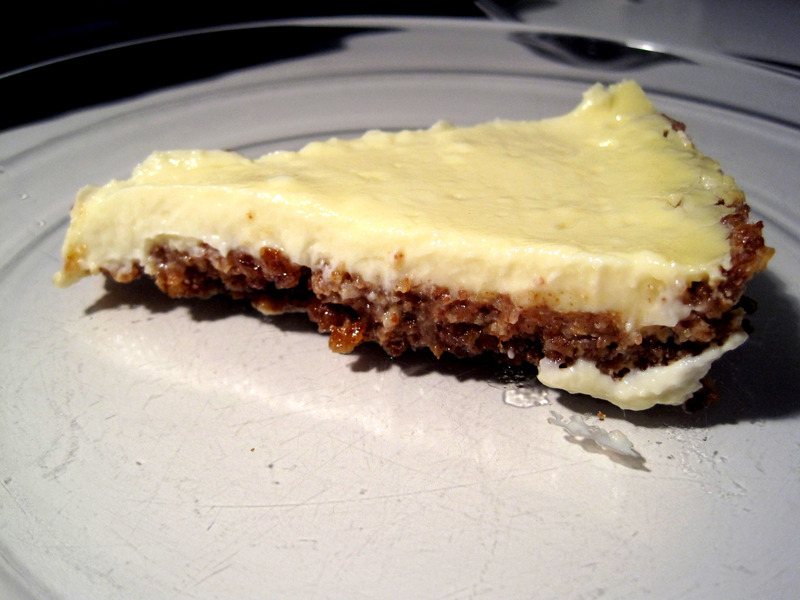 I’m so pleased that I found a key lime pie recipe that doesn’t involve excessive amounts of condensed milk. In fact, this one is primarily made out of Greek yogurt, a protein-packed powerhouse. I had a tub of Greek yogurt sitting in the fridge, and as I perused the weekly circulars, I saw that limes were going on sale at 5 for $1. (This is how I generally decide what to make. a) what I have in the pantry; b) what I can buy cheaply.) 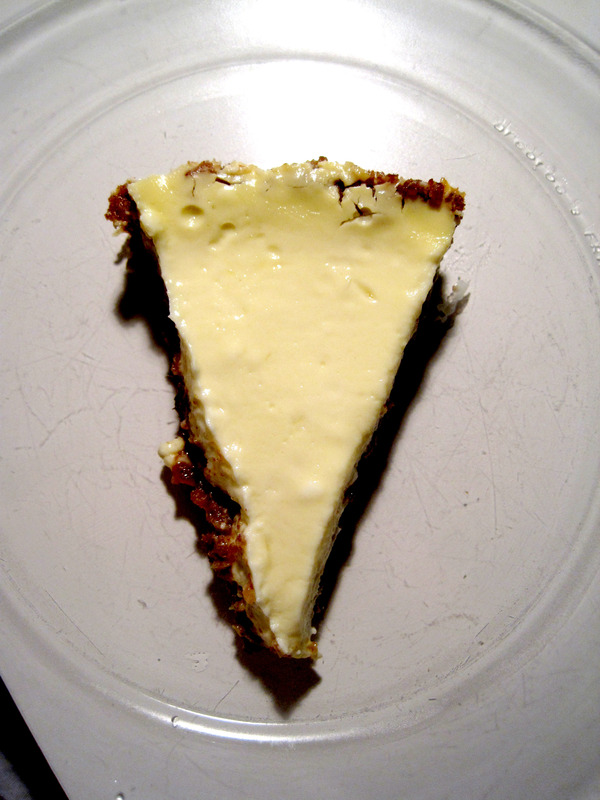 I put two and two together, and brainwave – I shall make a key lime pie! I did some digging around, and found this recipe from Obama Foodorama, a blog dedicated to the food initiatives of the White House. No surprises that they found a way to make a healthier key lime pie! I didn’t actually use key limes, but regular limes worked fantastic too. I really enjoyed the simplicity of the recipe. A lot of key lime pies require some kind of artificial or unhealthful ingredient, like gelatin, sweetened condensed milk or key lime-flavored yogurt – but the stiffer texture of Greek yogurt was sufficient to hold the filling together. I also invented a crust made out of an unconventional ingredient – not graham crackers, but bran flakes. I know, bran flakes in your pie crust might sound a little suspect, but with the addition of butter and sugar and a quick bake in the oven, it came out caramelized with a nice toothsome chew. You’re not going to mistake it for a graham cracker crust, but it held its own against the smooth tangy creaminess of the pie filling. 2. Stir bran flakes crumbs, sugar, and butter in a bowl until combined. Then press mixture evenly into bottom and up the sides of a 9″ pie plate. 3. Bake crust 10 minutes, then remove from oven to cool. 1. Whisk together yogurt, egg yolks, honey, and sugar; add juice and whisk until well combined. 2. Pour filling into crust, and bake for 20 minutes in 350°F oven (mixture will not be firm). 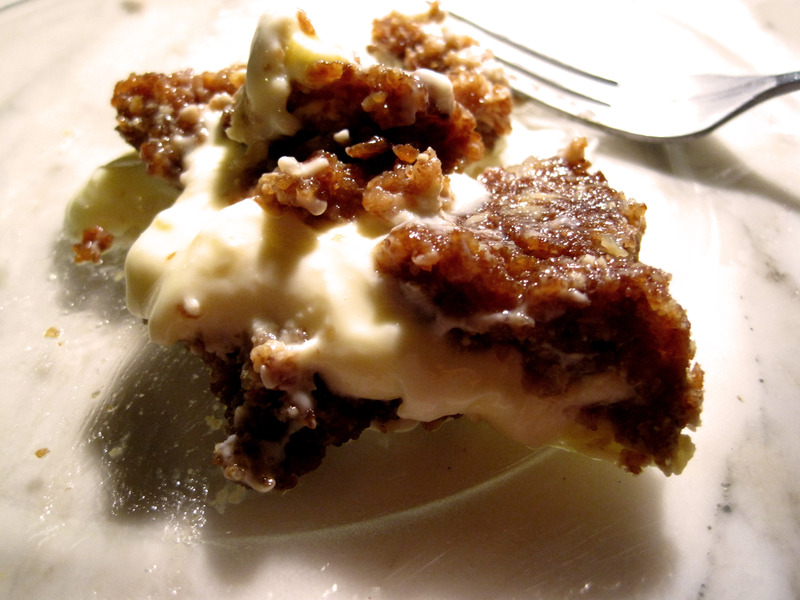 another recipe i found recommended *freezing* the pie (and keeping it in there) — you could try that and see if it ended up being more like a frozen yogurt pie..?